Russian River is coming to The Good Hop for SF Beer Week! On Friday, February 16th we'll have a plethora of Russian River beers both on draft and in bottles. 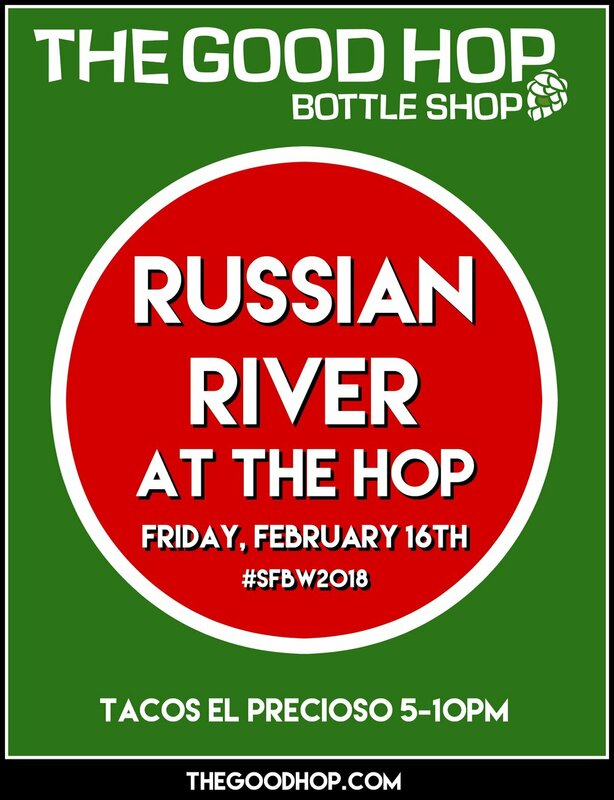 Russian River reps/crew will be in the building, Tacos el Precioso will be servin' up some tacos for your face, AND YES, we will be tapping Pliny the Younger! 1. Yes, we will be tapping PTY - ON FRIDAY FEBRUARY 16TH. 2. PTY pours will be ticketed. 3. Tickets will go on sale when we open our doors at 3pm. 4. Limit of 2 tickets per person, NO EXCEPTIONS. 5. Keg will be tapped at 6pm. 7. We will have 9 other RRBC beers on tap too! 8. RRBC folks will be in the house to hang!